Connectionist architectures have existed for more than 70 years, but new architectures and graphical processing units (GPUs) brought them to the forefront of artificial intelligence. The last two decades gave us deep learning architectures, which greatly expanded the number and type of problems neural networks can address. This article introduces five of the most popular deep learning architectures—recurrent neural networks (RNNs), long short-term memory (LSTM)/gated recurrent unit (GRU), convolutional neural networks (CNNs), deep belief networks (DBN), and deep stacking networks (DSNs)—and then explores open source software options for deep learning. Deep learning isn’t a single approach but rather a class of algorithms and topologies that you can apply to a broad spectrum of problems. While deep learning is certainly not new, it is experiencing explosive growth because of the intersection of deeply layered neural networks and the use of GPUs to accelerate their execution. Big data has also fed this growth. Because deep learning relies on supervised learning algorithms (those that train neural networks with example data and reward them based on their success), the more data, the better to build these deep learning structures. 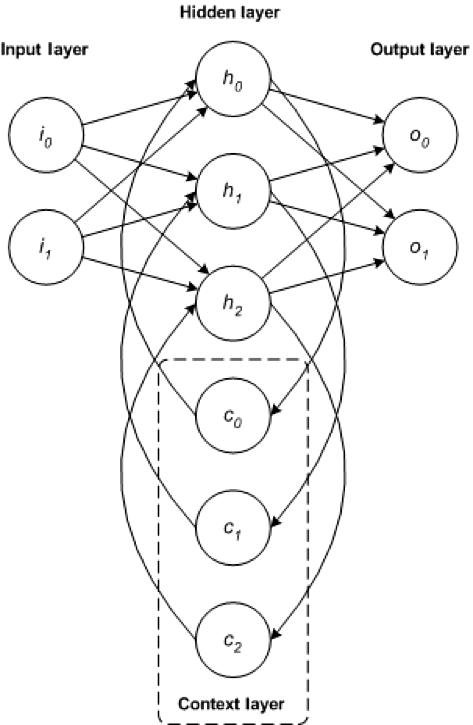 Deep learning consists of deep networks of varying topologies. Neural networks have been around for quite a while, but the development of numerous layers of networks (each providing some function, such as feature extraction) made them more practical to use. Adding layers means more interconnections and weights between and within the layers. This is where GPUs benefit deep learning, making it possible to train and execute these deep networks (where raw processors are not as efficient). 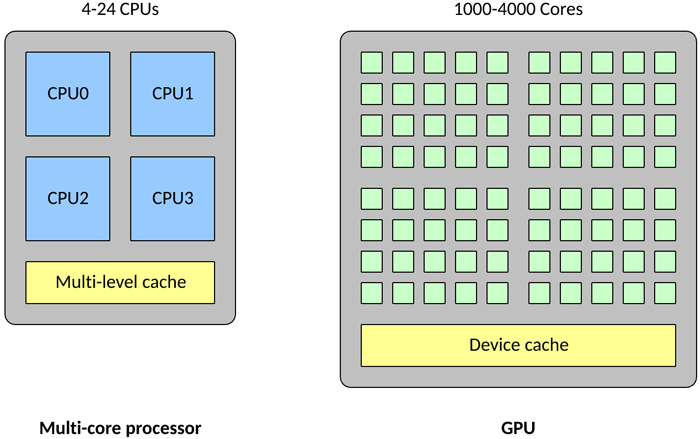 GPUs differ from traditional multicore processors in a few key ways. First, a traditional processor might contain 4 – 24 general-purpose CPUs, but a GPU might contain 1,000 – 4,000 specialized data processing cores. The high density of cores makes the GPU highly parallel (that is, it can perform many computations at once) compared with traditional CPUs. This makes GPUs ideal for large neural networks in which many neurons can be computed at once (where a traditional CPU could parallelize a considerably smaller number in parallel). GPUs also excel at floating-point vector operations because neurons are nothing more than vector multiplication and addition. All of these characteristics make neural networks on GPUs what’s called embarrassingly parallel (that is, perfectly parallel, where little or no effort is required to parallelize the task). The number of architectures and algorithms that are used in deep learning is wide and varied. This section explores five of the deep learning architectures spanning the past 20 years. Notably, LSTM and CNN are two of the oldest approaches in this list but also two of the most used in various applications. These architectures are applied in a wide range of scenarios, but the following table lists some of their typical applications. Now, let’s explore these architectures and the methods that are used to train them. The RNN is one of the foundational network architectures from which other deep learning architectures are built. The primary difference between a typical multilayer network and a recurrent network is that rather than completely feed-forward connections, a recurrent network might have connections that feed back into prior layers (or into the same layer). This feedback allows RNNs to maintain memory of past inputs and model problems in time. RNNs consist of a rich set of architectures (we’ll look at one popular topology called LSTM next). The key differentiator is feedback within the network, which could manifest itself from a hidden layer, the output layer, or some combination thereof. RNNs can be unfolded in time and trained with standard back-propagation or by using a variant of back-propagation that is called back-propagation in time (BPTT). 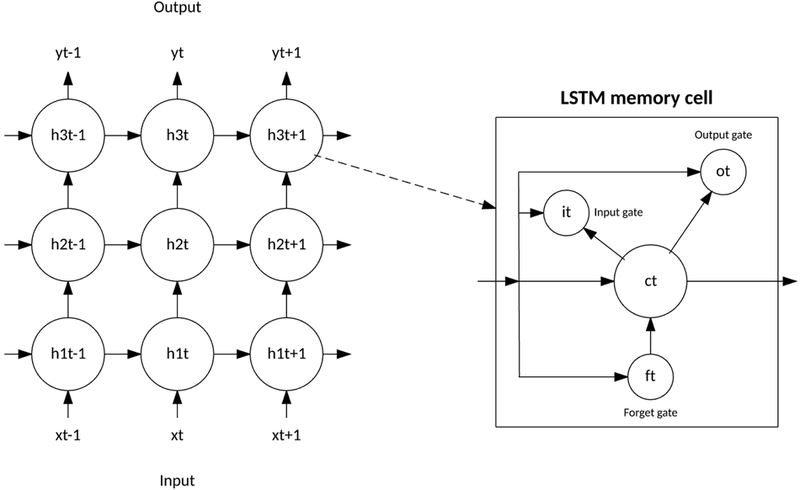 The LSTM was created in 1997 by Hochreiter and Schimdhuber, but it has grown in popularity in recent years as an RNN architecture for various applications. You’ll find LSTMs in products that you use every day, such as smartphones. IBM applied LSTMs in IBM Watson® for milestone-setting conversational speech recognition. The LSTM departed from typical neuron-based neural network architectures and instead introduced the concept of a memory cell. The memory cell can retain its value for a short or long time as a function of its inputs, which allows the cell to remember what’s important and not just its last computed value. The LSTM memory cell contains three gates that control how information flows into or out of the cell. The input gate controls when new information can flow into the memory. The forget gate controls when an existing piece of information is forgotten, allowing the cell to remember new data. Finally, the output gate controls when the information that is contained in the cell is used in the output from the cell. The cell also contains weights, which control each gate. The training algorithm, commonly BPTT, optimizes these weights based on the resulting network output error. In 2014, a simplification of the LSTM was introduced called the gated recurrent unit. This model has two gates, getting rid of the output gate present in the LSTM model. For many applications, the GRU has performance similar to the LSTM, but being simpler means fewer weights and faster execution. The GRU includes two gates: an update gate and a reset gate. The update gate indicates how much of the previous cell contents to maintain. The reset gate defines how to incorporate the new input with the previous cell contents. 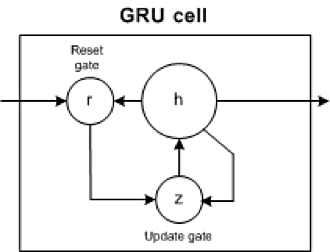 A GRU can model a standard RNN simply by setting the reset gate to 1 and the update gate to 0. The GRU is simpler than the LSTM, can be trained more quickly, and can be more efficient in its execution. However, the LSTM can be more expressive and with more data, can lead to better results. A CNN is a multilayer neural network that was biologically inspired by the animal visual cortex. The architecture is particularly useful in image-processing applications. The first CNN was created by Yann LeCun; at the time, the architecture focused on handwritten character recognition, such as postal code interpretation. As a deep network, early layers recognize features (such as edges), and later layers recombine these features into higher-level attributes of the input. The LeNet CNN architecture is made up of several layers that implement feature extraction, and then classification (see the following image). The image is divided into receptive fields that feed into a convolutional layer, which then extracts features from the input image. The next step is pooling, which reduces the dimensionality of the extracted features (through down-sampling) while retaining the most important information (typically through max pooling). Another convolution and pooling step is then performed that feeds into a fully connected multilayer perceptron. The final output layer of this network is a set of nodes that identify features of the image (in this case, a node per identified number). You train the network by using back-propagation. 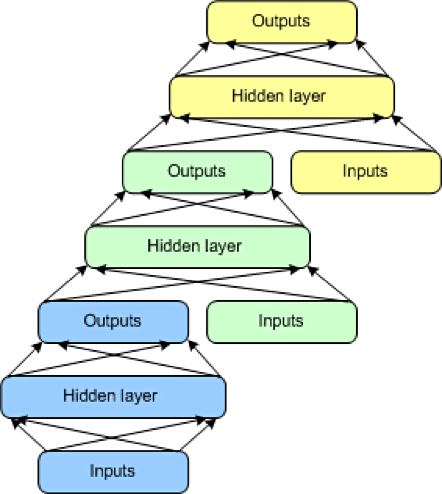 The use of deep layers of processing, convolutions, pooling, and a fully connected classification layer opened the door to various new applications of deep learning neural networks. In addition to image processing, the CNN has been successfully applied to video recognition and various tasks within natural language processing. Recent applications of CNNs and LSTMs produced image and video captioning systems in which an image or video is summarized in natural language. The CNN implements the image or video processing, and the LSTM is trained to convert the CNN output into natural language. The DBN is a typical network architecture but includes a novel training algorithm. The DBN is a multilayer network (typically deep, including many hidden layers) in which each pair of connected layers is a restricted Boltzmann machine (RBM). In this way, a DBN is represented as a stack of RBMs. In the DBN, the input layer represents the raw sensory inputs, and each hidden layer learns abstract representations of this input. The output layer, which is treated somewhat differently than the other layers, implements the network classification. Training occurs in two steps: unsupervised pretraining and supervised fine-tuning. 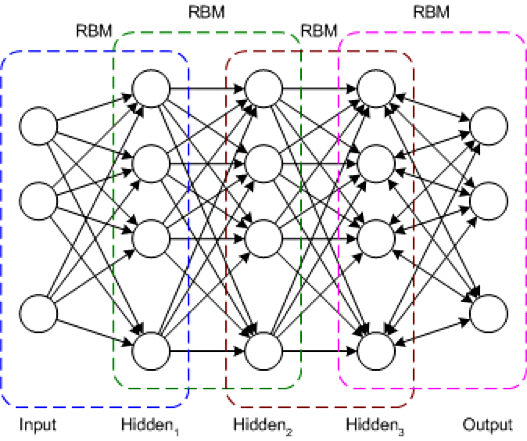 In unsupervised pretraining, each RBM is trained to reconstruct its input (for example, the first RBM reconstructs the input layer to the first hidden layer). The next RBM is trained similarly, but the first hidden layer is treated as the input (or visible) layer, and the RBM is trained by using the outputs of the first hidden layer as the inputs. This process continues until each layer is pretrained. When the pretraining is complete, fine-tuning begins. In this phase, the output nodes are applied labels to give them meaning (what they represent in the context of the network). Full network training is then applied by using either gradient descent learning or back-propagation to complete the training process. The final architecture is the DSN, also called a deep convex network. A DSN is different from traditional deep learning frameworks in that although it consists of a deep network, it’s actually a deep set of individual networks, each with its own hidden layers. This architecture is a response to one of the problems with deep learning: the complexity of training. Each layer in a deep learning architecture exponentially increases the complexity of training, so the DSN views training not as a single problem but as a set of individual training problems. The DSN consists of a set of modules, each of which is a subnetwork in the overall hierarchy of the DSN. In one instance of this architecture, three modules are created for the DSN. Each module consists of an input layer, a single hidden layer, and an output layer. Modules are stacked one on top of another, where the inputs of a module consist of the prior layer outputs and the original input vector. This layering allows the overall network to learn more complex classification than would be possible given a single module. The DSN permits training of individual modules in isolation, making it efficient given the ability to train in parallel. Supervised training is implemented as back-propagation for each module rather than back-propagation over the entire network. For many problems, DSNs can perform better than typical DBNs, making them a popular and efficient network architecture. Implementing these deep learning architectures is certainly possible, but starting from scratch can be time-consuming, and they also need time to optimize and mature. Luckily, you can take advantage of several open source frameworks to more easily implement and deploy deep learning algorithms. These frameworks support languages like Python, C/C++, and the Java® language. Let’s explore three of the most popular frameworks and their strengths and weaknesses. One of the most popular deep learning frameworks is Caffe. Caffe was originally developed as part of a Ph.D. dissertation but is now released under the Berkeley Software Distribution license. Caffe supports a wide range of deep learning architectures, including CNN and LSTM, but notably does not support RBMs or DBMs (although the coming release of Caffe2 will include such support). Caffe has been used for image classification and other vision applications, and it supports GPU-based acceleration with the NVIDIA CUDA Deep Neural Network library. Caffe supports Open Multi-Processing (OpenMP) for parallelizing deep learning algorithms over a cluster of systems. Caffe and Caffe2 are written in C++ for performance and offer a Python and MATLAB interface for deep learning training and execution. Deeplearning4j is a popular deep learning framework that is focused on Java technology, but it includes application programming interfaces for other languages, such as Scala, Python, and Clojure. The framework is released under the Apache license and includes support for RBMs, DBNs, CNNs, and RNNs. Deeplearning4j also includes distributed parallel versions that work with Apache Hadoop and Spark (big data processing frameworks). Deeplearning4j has been applied to various problems, including fraud detection in the financial sector, recommender systems, image recognition, and cybersecurity (network intrusion detection). The framework integrates with CUDA for GPU optimization and can be distributed with OpenMP or Hadoop. TensorFlow was developed by Google as an open source library and descendent of the closed source DistBelief. You can use TensorFlow to train and deploy various neural networks (CNNs, RBMs, DBNs, and RNNs) and is released under the Apache 2.0 license. TensorFlow has been applied to various problems, such as image captioning, malware detection, speech recognition, and information retrieval. An Android-focused stack called TensorFlow Lite was recently released. You can develop applications with TensorFlow in Python, C++, the Java language, Rust, or Go (although Python is the most stable) and distribute their execution with Hadoop. TensorFlow supports CUDA, as well, in addition to specialized hardware interfaces. Dubbed the “jet engine of deep learning,” IBM Distributed Deep Learning (DDL) is a library that links into leading frameworks such as Caffe and TensorFlow. DDL can be used to accelerate deep learning algorithms over clusters of servers and hundreds of GPUs. DDL optimizes the communication of neuron calculations by defining optimal paths that the resulting data must take between GPUs. Resolving the bottleneck of a deep learning cluster was demonstrated by beating a prior image recognition task Microsoft had recently set. Deep learning is represented by a spectrum of architectures that can build solutions for a range of problem areas. These solutions can be feed-forward focused or recurrent networks that permit consideration of previous inputs. Although building these types of deep architectures can be complex, various open source solutions, such as Caffe, Deeplearning4j, TensorFlow, and DDL, are available to get you up and running quickly. Go deeper into neural networks in this developerWorks tutorial on recurrent neural networks.